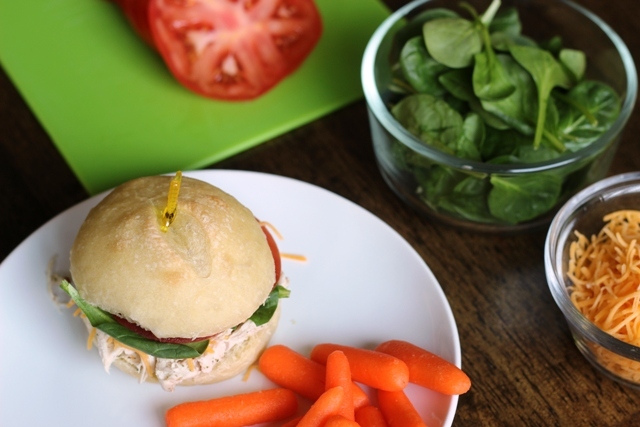 Planning a regular rotation of lunch items can make meal planning and prep loads easier. Having a weekly rotation or formula for the week has been one of my fallbacks for years. I love the beauty of Taco Night or Grilling Day. Last summer I shared my tips for dinnertime and the variety of ways that you can mix it up (protein, ethnic food, type of preparation). Awhile back I shared our regular breakfast rotation. It looks like I’m not the only one who enjoys a little routine when it comes to meal planning! 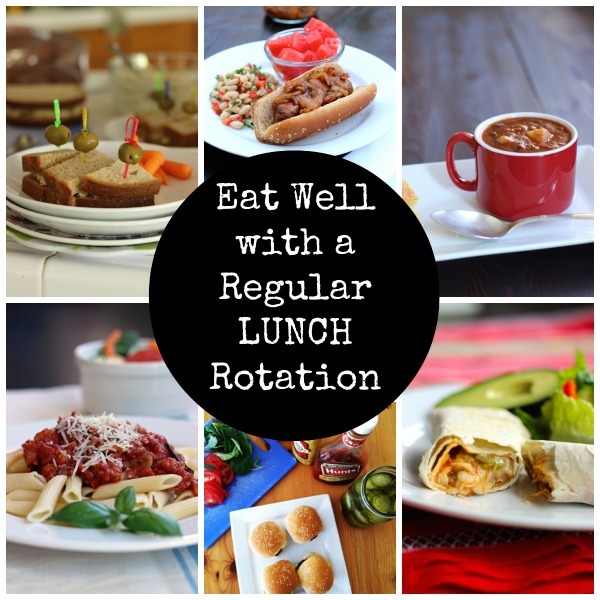 Many of you requested a play-by-play when it comes to creating a lunchtime rotation. After months, nay years, of being my guinea pigs, my kids really relish regular old meals that aren’t “experiments”. That’s what I try to do for lunches. Last summer FishBoy13 helped me develop a lunchtime rotation that everyone could be happy with. We do sandwiches about three times a week, with Turkey Sandwiches, Sunbutter and Jelly, Tuna Salad, and Grilled Cheese Sandwiches topping the list. A sandwich bar is my go-to when we’ve got a stocked fridge. I love to use the slow cooker for hot sandwich fillings like Sweet and Sour Pulled Chicken, Pulled Chicken Sliders, and Hot Italian Beef Sandwiches. In the absence of meat, I make Egg Plus Salad Sandwiches. I make my own sandwich rolls and burger buns, but for sandwich bread, I buy 4 to 5 loaves of Trader Joe’s Harvest Whole Wheat Bread each week. It’s sweetened with honey and contains no weird ingredients. Since there are no preservatives, I leave one loaf on the counter and the rest go to the freezer. I buy a whole roasted turkey breast from Costco. It’s nitrate- and nitrite-free. I slice it myself. We lean on Tillamook cheese and sliced Jarlsberg from Costco as well as fancier cheeses at Trader Joe’s. As I mentioned yesterday, I’m on the fence about our sunbutter/almond butter dilemma. Trader Joe’s and Costco are the only sources I’ve found for soy-free canned tuna. Having grown up in Southern California, I have zero qualms about eating Mexican food every day of the week. It’s pretty much a staple around here. That means burritos, tacos, and quesadillas are fair game at our house. 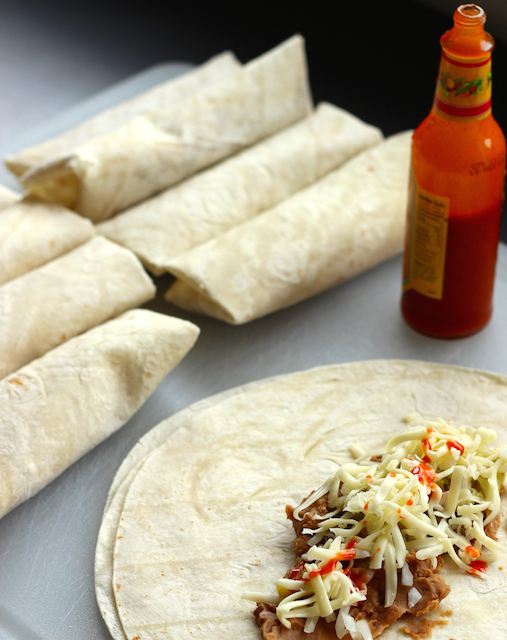 I often make a batch of burritos for the freezer so that we have a quick lunch or snack at the ready. If I’m really on my game, there’s a container or two of taco meat in the freezer as well. Plain old beans and rice with lots of toppings is one of our favorite ways to eat good and cheap. I buy Trader Joe’s corn and flour tortillas which have very few ingredients. Like the bread, they’ll spoil quickly, so I keep a stash in the freezer. If FishPapa is home, he organized the tortilla team to make homemade corn tortillas. I buy canned beans or cook up dried beans and freeze them for quick lunches. Again, if I play my cards right, I’ve got containers of pasta sauce in the freezer. 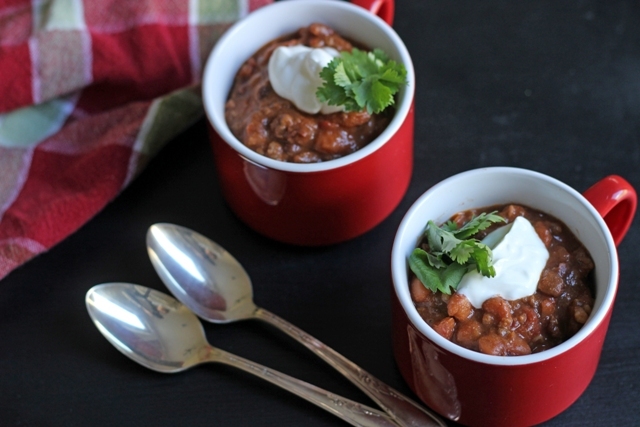 Chili or soups, particularly those made in the crockpot or made in advance and frozen help me out at lunchtime. While I grew up opening a can of soup for lunch, that’s a habit I could never afford when we went to one income. I found that it was cheaper to make it myself. I also found out that homemade tastes better than the can! Go figure. If your people don’t all like the same kinds of soups (mine don’t), make a few big batches and freeze the soups in serving size cups. At lunchtime or when you’re packing lunch boxes, you can pull out each person’s favorite flavor. Voila! The convenience of the can without all the crap. 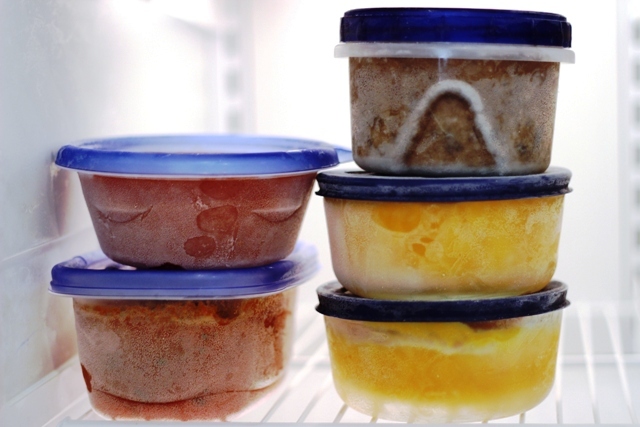 Grab this FREE printable freezer cooking plan for Soups, Stews, and Breads. 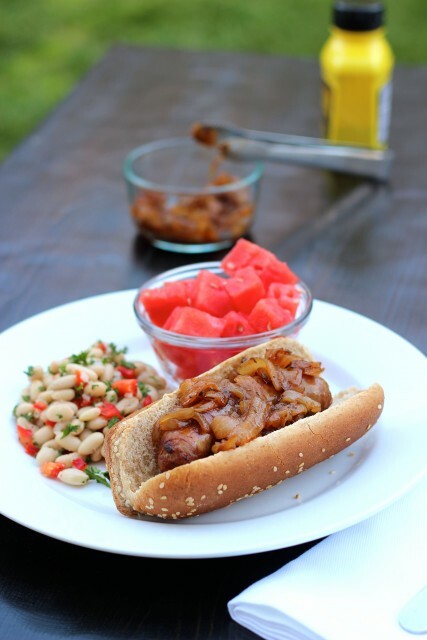 At least once a week, particularly on weekends, we have some kind of grilled meat in a bun: hamburgers, hot dogs, or brats. I buy the ground beef or turkey, hot dogs, and sausages on sale and stash them in the freezer. I’ve also had good luck finding the gourmet/healthier sausages marked down because they were close to their sell-by date. Usually, I make the hot dog or hamburger buns myself, but not always. The biggest problem with this type of meal is that my kids love it. That means they want to eat two, three, or FOUR of each. That’s a lot of meat. And meat, at least the good kind, isn’t cheap. However, a trip to In-N-Out Burger is now approaching $30 for our family of 8 (no drinks, we split fries). I think I’ll price out an average burger or hot dog meal and see how many portions I can get everyone for the same or less. Stay tuned. 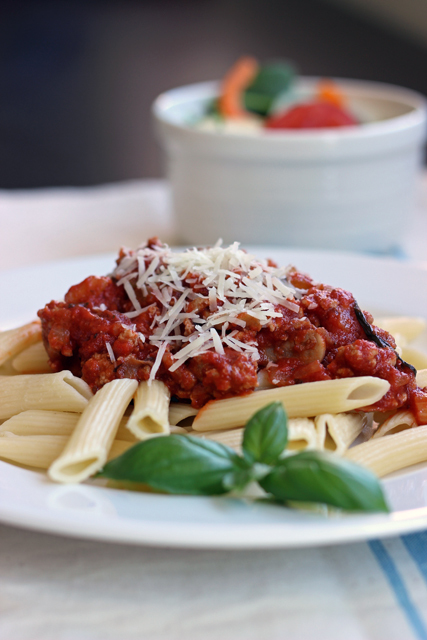 Having a stash of freezer meals in reserve can really help you out when it comes to serving quick and delicious lunches. They will be healthier, too! Meal rotation is really important so as to keep the fam from not getting bored. I pack my husband’s and daughter’s breakfast and lunch every day and I always try to make sure they have a variety each week. For my husband, I will pack him a variety of sandwiches on different breads, rye, multi-grain, hard rolls, or wraps. It can be anything from roast beef to turkey, to ham, tuna salad, egg salad, chicken salad or a homemade sub. But I usually don’t give him sandwiches everyday. Sometimes, it’s last night’s leftovers, or rice bowls with leftover rice and chicken, soup, quesadillas, or what you call a snacky lunch. My daughter, who is 24, more than capable of making her own lunch but this mom still wants to do it, so why should she fight it. With her, there is always a little more thinking involved because she only eats “healthy food”, and omits pasta, rice, potatoes, many times bread. Quite honestly, I am always a little at a loss of what to give her to make her lunches more variable. Most of the time, I just make her a salad. Sometimes, I cut up veggies and give her those with a low fat veggie dip but isn’t that almost the same thing as salad anyway? 🙂 Sometimes I’ll cook up a couple of turkey sausages and give her that with some veggies. Other times, I’ll sneak in some kind of wrap with turkey; she loves wraps but for the moment, she wants to omit any kind of bread from her diet. When I just don’t feel like making a big deal, I’ll give her a wrap and figure that if she’s hungry, she’ll eat. As for my husband, there are lots of guys at work whose wives do not make their lunches and they are forever circling like vultures around my husband when he takes out his lunch. Lastly, I usually always have some kind of freezer meals and some that are only enough for one person so I always have those to rely on too. Can I just live with you? My youngest take sthe same thing, every day. I can’t get him to eat anything else. How old is your youngest? This particular daughter I am speaking of used to eat nothing but chicken nuggets. I remember when she was just in the beginning of grammar school, I used to have to make her taylor ham and cheese on an English muffin. Now if you’re not from New Jersey, you’re not getting taylor ham. That’s strictly only for people in New Jersey, Sorry. But it’s really pork roll and maybe wherever you’re from, you might be able to get it but the true taylor ham is only available here as far as I know. Please correct me if I’m wrong. Anyway, between that and chicken nuggets, that’s all she ate. I sometimes had to give her chicken nuggets for breakfast before school just so that she had something in her stomach. So if you’re son is picky now, believe me, from everything I know about boys from my friends, they eventually eat you out of house and home so get ready, my friend. 🙂 I love to cook and if you need any tips, please let me know. but sheesh – thanks for pointing this out! Ha! Yes. I found that out during my whole 30 last year.